Expert tip: This is one of the most popular yoga retreats offered in Egypt. A Yoga Retreat & guided sacred journey to the Temples of Ancient Egypt along the lush Nile Valley with luxurious accommodation on a private 5 stars island resort and luxury Nile Cruise Ship from Luxor to Aswan. With daily yoga and meditation sessions, aromatherapy and Thai yoga massage as well as Spa treatments available upon request. Facilitated by spiritual guides with shamanic training and high-level esoteric knowledge of the ancient Egyptian wisdom tradition, professional Egyptologis, private tours and sailboats for sunset and special visits to local gems. An overall professional team at your service 24/7. Providing a healing, cultural and mystical experience with nature walks, temple visits, swimming, sunbathing, horseback riding and direct mystical experience of ancient Egyptian spirituality at sacred temples. Experience healing and awakening in nature. Practice yoga along the banks of the Nile. Relax in a luscious luxurious environment. Receive guidance and healing. Meditate at Egyptian temples. Experience sacred knowledge and receive spiritual transmissions. We cater for all ages, races, religions, diets and special needs. Providing quality service to ensure a high-end luxury experience with deep connection and exposure to local culture and the gems of Egypt. Organic delicious Egyptian food. (Vegetarian, Vegan, Seafood and Paleo diets). Daily guided temple visits and daily yoga and meditation sessions. The Yoga style we love to teach is physically smooth, gentle and flowing. Simple practices from Hatha and Jivamukti combined with deep positions from Yin Yoga. Holding the Asanas for longer and really diving into them to relax and connect with the body. We want to come into the present moment with yoga and be fully aware of ourselves. To connect with our inner silence, body, and soul, by mindfully relaxing, letting go, softening and being aware of our breath. Our yoga practice is designed for strengthening our bodies and becoming more flexible. The immediate effect is feeling more comfortable in our bodies. It's not about being good or doing the exercises perfectly in an acrobatic way. Everybody begins where he or she is at, and everyone can do it. We want to enjoy, get in our power, release stuck emotions, feel good and free. Let your worries go... be happy with who you are, love your body and feel yourself opening to the true you. Celebrate your existence by blooming as the beautiful flower you are! Meditation is the key to your inner essence, the space of divine oneness. If you get the connection to a few simple tools, you can always dive into your inner silence, which opens you up to the beauty of life. Wherever you are and whatever you do. So what we do is show you techniques you can use in daily life, which always bring you back to yourself. We don't sit down and try to think of nothing, we do active meditations, visualizations, temple meditation, physical meditation and integrate meditation in our life in a joyful and eye-opening way. There will be a point, where you may realize that there is actually nothing to do, because it doesn't matter what you do...it's just about being present in the moment with everything you do, being mindful and witnessing yourself. With that the emotional issues will naturally resolve themselves. Where consciousness is appearing, you awaken and can laugh about problems that normally would bother you... step out of the past and come into the most important moment in your life: now! Right here and now is infinity, where life and death turn into immortality. Luxurious five star resort located on its own private island on the Nile in Luxor with three large swimming pools by the Nile, luscious gardens, palm trees, birds, restaurants, organic fruit and vegetables growing and served on the island, open buffets, room service, spa, shopping, spacious green fields, gym, sauna, sports, bars, yoga, private docking for sail boats. Bungalows, Villas and spacious luxurious rooms of different sizes facing the Nile and beautiful gardens everywhere. Double Room by the Nile: Beautiful and luxurious airconditioned rooms with 2 queen size beds, private terrace and garden. Private bathroom. Minibar. Cable TV. Safe. Closet. Fridge. Room Service. Wifi. Surrounded by lush green gardens and beautiful swimming pools directly by the Nile. Enjoy nature walks and sunsets by the Nile on this spacious private island. Organic fruit and vegetables served along with delicious meals at the restaurants. Sailboats available from the resort's private dock. Gym, Spa, Sauna & Sports facilities. Single Room with Garden View by the Nile: Beautiful and luxurious airconditioned rooms with king size bed, private terrace and garden. Private bathroom. Minibar. Cable TV. Safe. Closet. Fridge. Room Service. Wifi. Surrounded by lush green gardens and beautiful swimming pools directly by the Nile. Enjoy nature walks and sunsets by the Nile on this spacious private island. Organic fruit and vegetables served along with delicious meals at the restaurants. Sail boats available from the resort's private dock. Gym, Spa, Sauna & Sports facilities. Enjoy staying at our Luxurious 5 Stars Nile Cruise Ship with full board meals served at the restaurant (Vegetraian, Sea food, Paleo). Practice Yoga on the dock as we cruise along the Nile. Enjoy the view of the luscious Nile Valley and take excursions to the Ancient Egyptian Temples located along the way. Friendly staff, room service, laundry, shopping, cafe, bar, dance floor, jewelry shop, parties and special treats! Double Room with Nile View: Spacious airconditioned double rooms with direct view of the Nile as we sail to visit the Temples along the way and practice Yoga on the Ship's deck. Private bathrooms with bathtubs. Safe. Closet. Room Service. Cable TV. Internet Access. Fridge. Daily cleaning and beautification by the generous staff. Single Room with Nile View: Spacious airconditioned rooms with direct view of the Nile as we sail to visit the Temples along the way and practice Yoga on the Ship's deck. Private bathrooms with bathtubs. Safe. Closet. Room Service. Cable TV. Internet Access. Fridge. Daily cleaning and beautification by the generous staff. 5 stars hotel located by the Giza pyramids with view of the pyramids. Rooms with garden access and terrace. Garden, Pool or Pyramid views. Quick access to sacred sites. All modern facilities available for your comfort. Yoga and meditation held in the private hotel garden. Double room with Pyramid or Garden View: 2 luxurious Queen beds with private terrace and garden view. Private Bathroom. Air conditioned. Room Service. Cable TV. Phone. Safe. Closet. Quiet and peaceful. Single Room with Pyramid or Garden View: 1 King size bed or 2 Queen size beds. with private terrace and garden view. Private bathroom. Air conditioned. Safe. Closet. Room service. Cable TV. Quiet and peaceful. Our Nubian Lodge is located on a special Nubian Island directly facing the Temple of Isis and situated directly on the Nile. Special dome shaped rooms with Nubian style architecture and design carved into the natural rock formations on the island. Outdoors fire place and common space for meditation and Yoga facing the Nile. Fantastic Nubian crew serving the most delicious traditional meals with their special cultural touch. Traditional music and dances. Henna tattoos and songs. Stargazing at night. Bird watching and fishing boats as we're located on an island right next to the mystical island of Horus the Falcon God and the original Isis Temple of Egypt. This is a traditional Nubian island with only Nubian people living in the village nearby. The outdoors lounging areas are tucked in the peaceful and quiet environment with plenty of Nature to enjoy the mystical atmosphere on this island. A place of Mystery & Magic. Double Rooms with Nubian Style Domes tucked in Nature by the Nile: These dome shaped rooms are built with Nubian style architecture and design carved directly into the natural rock formation on the island, which adds this mystical touch. The windows are facing the Nile providing direct view of the Isis Temple located nearby on its own island. Join us on this sacred journey to all the major temples of Ancient Egypt along the lush Nile Valley to experience the resonance of this sacred land and receive the wisdom codes from its living temples, activating your genetic memory and inherent knowing, while practicing daily yoga and meditation. This is an opportunity for the embodiment of divine love and remembrance of the sacred keys of divinity within you. Accessing Ancient Egyptian Wisdom through direct experience and transmissions, while working with the Divine frequencies of the Neteru and integrating these energies into your body through yoga, meditation, and inner work. Ancient sacred sites were created with divine awareness with an impeccable precision of mathematical and sacred geometrical architecture combined with a specific combination of natural elements over the earth's most powerful leylines to create harmonic resonance with archetypal energies or properties (frequencies) of spirit or source expressed in nature as a living conscious energy, bridged, and interacting through humanity. 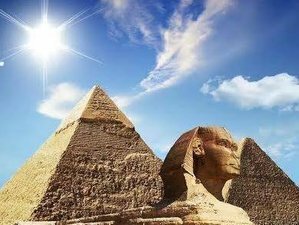 Our journey will take us through the temples to experience consciously these energies and creative principles within oneself, which the Egyptians identified as the Neteru. The journey is facilitated by Egyptian Adept, Ahmed el Feqy, founder of Sungate, and Stargate Tours, with Yoga teachers Gudrun Meincke & Angel Amita (Sacred Journeys Now). Together setting the container with high frequencies to assist you on this journey through the mystical land of Egypt to experience her living temples and Divine wisdom codes. From the energetic center of the Great Giza Pyramids and Sphinx to Abydos traditional village, Jolie Ville King's Island Resort in Luxor, and Aswan Isis island retreat, via luxury Nile cruise ship, with a special visit to the Temple of Isis on the full moon. With group circles, meditations, facilitation, and daily yoga. We are honored to receive you. Arrival at Cairo International Airport. Obtaining the entry visa at the airport. Transfer by airport limousine to Mercure Cairo Le Sphinx Hotel in Giza, located by the pyramids. Check-in. Relax and unwind from the journey. Meet for group dinner and introduction. After our morning Yoga session and breakfast, we will visit the Giza Pyramids & the Sphinx. Transport by private bus. Entrance into the King’s Chamber of the Great Pyramid, toning activation, connecting to the Galactic Center, Solar Resonance and crystalline healing frequencies. Then walk the Sphinx causeway from the second pyramid leading to the Sphinx Temple. We will spend about three hours at the Giza Plateau, the throat chakra of the planet, then return for lunch and have a free evening for a group session, meditation and integration. Constellations: Sirius, Orion, Leo, Pleiades. After our morning yoga and a day visit to Sakkara Temple we will have an outdoors lunch by the pool at the Sakkara Country Club followed by a visit to the Hotep Temple of the Sun at Abo Ghorab, one of the oldest sites in the area. Hotep is an ancient crystalline altar in a sacred geometrical formation aligned with the four directions and known to be the landing pad of the Neteru (Gods). The Neteru is the divine creative principles and cosmic forces of nature known as Archetypes in the Egyptian Pantheon. We will witness the sunset while meditating on top of the collapsed pyramid at Abo Ghorab with a panoramic view of the Giza, Abu Sir, Sakkara, and Dahshur pyramids. And return in the early evening to relax at the hotel, preparing for our early flight to Luxor the following morning. After enjoying an early breakfast we will check out of the hotel and transfer by private bus to the Cairo airport for an early flight to Luxor. Upon arrival in Luxor, a private bus will transport us to our luxury resort, situated on its own private island growing its own organic fruit and vegetables. We will check in the Jolie Ville King's Island Resort and have a relaxed day by the Nile and the beautiful pools surrounded by lush green areas followed by an afternoon yoga session. Then visit Luxor Temple in the evening with our Egyptologist guide and have a group meditation at the holly of hollies inside the temple then return for group dinner. The main deity in Luxor is Amun Ra. The primordial deity symbolized by wind, the unseen realm. The invisible aspect of the Sun. Chief Deity and Supreme Creator God. We will store our luggage at the resort and check out in the morning, to take an early private bus ride to Abydos (three hours). Upon arrival we will check in the Flower of Life Guest House, a village house run by local family of wisdom keepers, situated at the edge of the village by the Ramses Temple. After lunch we will visit the Temple of Seti and the Osirion. These are very significant temples due to the spiritual resonance of this land, which was a pilgrimage site and spiritual center in Ancient Egypt. Abydos indigenous name is Ta Wer, meaning the abode of the Ancient Ones. This is where the first Egyptian Kings were found and it dates all the way back into prehistory. The temple is dedicated to Ausir (Osiris or Ausar), the archetype of the Divine Primordial Father. Symbolically represented by the Djed Pillar of light, which correspond to the spine and lingam in the human body. Representing the principle of resurrection, renewal, and regeneration through the journey of the Soul into the afterlife going through the cycle of Rebirth. This is why Ausir represents the Lord of the Underworld, for it is the stage in the Sun's cycle as it journeys through the night to be reborn again at dawn. The temples are linked to Sirius and known to be the location of an ancient stargate. There is a lot of activity in the spiritual realm at this site, which can be sensed and witnessed in silence on the inner planes. After our early morning Yoga session and breakfast we will say goodbye to Abydos and transfer by private bus to Dendarah (two hours) as we make our way back to Luxor. We will visit the Hathor Temple in Dendarah for the day. Hathor is the Birthing principle of Nature, the archetype of the Divine Nourisher. As the nourishing mother aspect, her symbol is the cow and her tools are music, sound, healing, dance and all the gentle nourishing qualities of the mother. She is the birthing principle. The Lady of Love, Venus, the Healer, and the heavenly seven maidens or heavenly realms. The female consort of Heru (Horus), his wife, that’s why her name is Hat-Heru. Hat is the house or womb of nature and Heru is the realized Divine Principle. The temple stands alone surrounded by an ancient wall, giving the captivating sense of timelessness. With magnificent pillars with Hathor's face and Nut the Sky Goddess on the ceiling as the overarching principle of the Divine Primordial Mother. For the Egyptians all these principles are linked as a sequence in nature from the Macrocosm into the Microcosm. The idea is for the human to relate to such principles in a personal manner in daily life, thus transcending mundane life into the heavenly, cosmic and celestial or spiritual reality. There is no separation, for the Divine qualities must be present through our actions, thoughts, feelings, and deeds. It is, therefore, a matter of purification, to raise our consciousness and vibrations to the heavenly realm and invite them into our material physical daily life. This is the Union of Heaven and Earth. God and Human. Spirit and Matter. Male and Female. Consciousness and Body. The principle of Embodiment. The experience of birth, rebirth, nourishment, and healing is the highlight of this temple as we walk through the gates of time experiencing long forgotten unknown and untold mysteries that remain resonant within the walls and harmonic pillars of the temple, into the hidden underground secrets watched over by the celestial heavenly realms of Nut the Sky Goddess, mother of all. We will then return to Luxor by our private bus (one and a half hour) to arrive back where we started at the Jolie Ville resort, unwind from the journey and share a group dinner by the Nile. With an overnight on King’s Island. After our early morning yoga session followed by breakfast we will have a guided visit to Karnak Temple with our local Egyptologist. Karnak is a conglomerate of temples representing the various Egyptian Dynasties. It is a journey through time experiencing the passage through the Dynastic Egyptian lineages as we walk the energetic Leylines going through the center all the way to the holy of the hollies. Walking through harmonic pillars and obelisks built to create a resonance housing the Neteru. Ultimately this is the purpose of the temple, to connect humanity to the Divine realm of the Neteru. We will visit the famous shrine of Sekhmet, the Solar Lioness Goddess, and her male consort Ptah, the Architect Creator. Khnum the Moon God. The sacred lake and seven-dimensional gateway of Ausir (Osiris). After our day visit, we will return to our island resort to relax, eat and have a break then gather again for a group session. Followed by dinner and overnight on King's Island Resort. Today we will check out of the island resort after our morning yoga session and breakfast then move to our luxury Nile Cruise ship to embark on a three day Nile journey to Aswan, where the Isis Temple is located, visiting beautiful Temples along the way. After check-in we will visit Hapu Temple on the western bank of the Nile. Then return to the boat for embarkation to Aswan. We will have a relaxed schedule with a free evening for group sessions and personal work. With lunch, dinner, and overnight on the cruise ship. Sailing up the Nile we will visit the Edfu (Horus) Temple early in the morning and Komombo (Sobek) Temple around sunset. The boat will be sailing up the Nile all day and we will have our yoga session in the afternoon as we're sailing on the Nile making our way to Aswan, the Nubian land. Breakfast, lunch, dinner, and overnight on the cruise ship. Heru (Horus) is the Sun King, symbolized by the Falcon with the Crown and the Eye of Horus which represents the Pineal Gland. This is the Divine Masculine energy representing the Pharaoh King of Egypt, who is the spiritual leader of the people, the realized Divine Principle. The one who mediates between the people and the Neteru (Gods, Angelic Realm, or Cosmic Archetypes). There are five aspects of Horus representing his development from birth to maturity to finally unify with Ra, the Sun God, also symbolized by the Falcon with the Sun Disk, in the form of Ra-Horakty, Horus of the Two Horizons. This is the principle of attainment of Divine Perfection. The completion of the spiritual journey reaching maturity, unifying both horizons of the dual nature of creation as night and day, light and dark, male and female, spirit and matter, life and the afterlife. RA (Sun) - Akhet (Horizon) - Heru (Horus). A winged Lion. Sobek is the crocodile Neter, representing fertility and power. Integrating the reptilian aspect of human DNA and the base chakra, overcoming fear with the right use of power and healthy sexuality, the potency of the fertile principle in Nature. In Egyptian mythology, Sobek guards Ra through the journey into the underworld and helps him devour the enemy represented by the three-headed serpent, Apep. The dual aspect of Sobek and Heru present at the Komombo Temple is an affirmation of that Union between the spiritual leader or King of Egypt and the principle of Fertility and Power. The Realized Divine Presence. Today we arrive with our cruise ship in Aswan and have a free flowing day. Our daily morning Yoga session is followed by breakfast on the ship and free time. We will take an afternoon felucca sailboat to Elephantine Island and visit the Khnum temple. Elephantine Island was a major port on the Nile in ancient times. It has a Nilometer, Khnum temple and the remains of the old town and Jewish temple that was once located there. There are some stories that the Ark of the Covenant was once kept secretly on the island. Today there is an ongoing excavation on the island and a local Nubian village. Breakfast, lunch, dinner and overnight on the cruise ship. After breakfast we will check out of the boat and transfer by a short bus ride then motorboat to Philae, where the Isis Temple is located and our island retreat at the Nubian Camp, strategically located adjacent to the Temple of Isis, the Divine Mother and Creative Principle. We will check in the Nubian camp which we will have for ourselves for the following three nights. Relax and enjoy nature all day. Have free time and group sessions. The Nubian tribe is in the southernmost part of Egypt, they are dark skinned and more African looking. They have their own language, art, music and traditions. They are people of heart, extremely sensitive, pure and high spirited. The word Neb in Ancient Egypt means Gold, for there is gold in this land and definitely the vibration of gold itself is accessed in the atmosphere, which has a mystical nature. There is a feeling of communion with the Divine Mother and the nurturing element of Water. After our morning Yoga session and delicious traditional vegetarian Nubian breakfast we will have our special visit to the Temple of Isis. Auset (Isis) is the Divine Cosmic Mother, the principle of the Feminine Creative Power, she encompasses all the feminine attributes for she is the Divine Feminine Principle herself, the creative power that conceived, both physically and metaphysically, all living creatures. Her native Egyptian name is Auset, "Aus" represents the Source, the power and “et” is the feminine quality added to the name. Auset also means The Lady, for she is the Lady of Heaven and Earth. Representing both the Universal Womb and Earth. Her symbol is the Throne as she is the Crown of Creation and her star is Sirius (Sothis), the blue star. Auset is the Feminine Principle of Nature, receptive of every form and of generation, she has countless attributes and names as she manifests in all her qualities. That’s why she’s also known as She of the 10,000 names. We will immerse ourselves in this feminine quality of the Cosmic Divine Mother and attune to this nature within ourselves. Understanding the mysteries of the virgin birth, the Madonna, chastity, purity and the creative feminine that births the perfect divine-human from within. A day of stillness and silence. Taking in all the magic. This is our closing circle day as we relax deeper and deeper into this sacred Presence, finding the space of anchored stillness within ourselves, supported and nourished by the Neteru and elements of Nature, balanced with the flow of life within us, through us and all around us. We will have our celebration expressing gratitude and joy for the completion of this journey. Perhaps a Nubian dance party? With love and gratitude. The journey continues back home. Until we meet again. In the heart of mystery. Thank you. Organized and facilitated by Ahmed El Feqy (Sungate - Stargate Tours) with yoga and meditation teacher Gudrun Meincke. Ahmed is leading sacred journeys and spiritual retreats with temple activations and spiritual healing ceremonies at sacred sites across the world for over a decade. His work is focused on self mastery, spiritual alchemy, transformation and healing. He practices Sungazing, Yoga, Qi Gong, Meditation, Shamanism and Energy Healing Work. He is an Adept of Ancient Egyptian Wisdom Tradition, learned from spiritual elders and indigenous wisdom keepers in Egypt, Peru and North America. His passion is in organizing transformation retreats for spiritual seekers finding inner peace and guidance. Yoga Teacher, Thai Yoga Massage Therapist and Intuitive Healer with degree in Psychology. In depth shamanic training and professional experience as hostess for travel groups. She holds a safe sacred space for healing, getting in touch with inner silence and one's innate wisdom. Also vegetarian chef, nutritionist, aroma therapist, self care specialist and life coach. This retreat will take place in Cairo - Giza, Abydos, Luxor, and Aswan, Egypt. At 5 stars luxury hotels, island resort and Nile Cruise Ship. Breakfast is included everyday, lunch and dinner are included in some days, on the Nile Cruise Ship and Nubian Island Lodge. The deposit is fully refundable if the booking is cancelled up to 80 days before the arrival date.